In this article, you will learn how to use JdbcTemplate to execute a query. 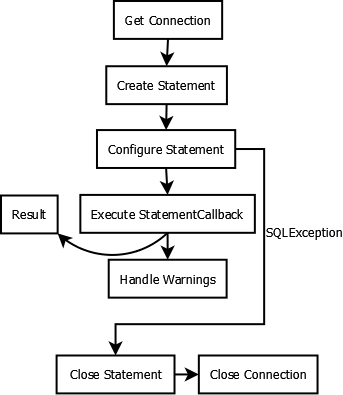 In the below diagram, you can see the basic template of a JDBC query process. Spring provides callback method at various points. One of them is when you want to execute a statement. You can encapsulate the actual execution code within an object StatementCallback class. In our example, we will query employees and return them as beans. The most simplest, approach is to pass the sql to queryForList and it will return a List of rows where each row is a Map of column values. 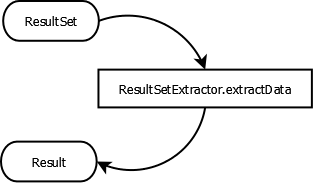 To understand the role of ResultSetExtractor, lets go back to our query diagram to the step where we call executeQuery on the statement object. The result we obtain will is in the form of ResultSet. You may want to convert the ResultSet into a more specific type like list of Employee beans in our case. To achieve this you will have to iterate through the ResultSet, extracting each row into Employee object and add it to the list. This can be encapsulated within spring provided ResultSetExtractor callback object. In the previous example, we have iterated through the ResultSet and manufactured Employee bean for each row. We can avoid this iteration by using another spring provided callback class called RowMapper. 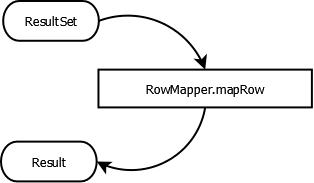 All we have to do is implement RowMapper and pass the sql and the RowMapper object to it to query method. In the below method, you will notice we don’t iterate through the ResultSet, all we do is just convert the ResultSet into an Employee bean and return it. JdbcTemplate takes care of iterating and adding the Employee bean to the list.